This is a great playground in its own right, with lots of equipment and within the bush setting of the local camping ground. But if there’s an adult in your party who wants to look at the Greytown shops, this playground is close by for another adult to take the bored kids! 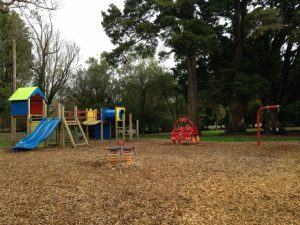 The equipment includes a long slide, a spacenet for climbing, a couple of monkey bar courses and a section (not fenced off) for younger kids (see photo). It is an easy walk from the main street with parking, a drinking water tap and toilets located right next to the playground. There are also tennis courts, cricket nets, a sports ground, and lots of trees for shade. Plenty of space for a picnic and to run around.